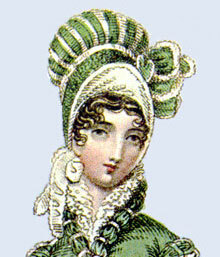 Today we have a walking dress from La Belle Aseemblée, 1817. While the Regency period strictly lasted from 1811 to 1820, the Empire style of clothing began in the 1790s and slowly phased out during the 1820s. This style is characterized by long, lean lines and a very high waist. By 1817, the fashion was beginning to change. Waists were still impossibly high, but the narrow column skirts were widening into a more graceful silhouette. Petticoats were few, but a small bum roll could be worn to help the skirt fall properly in the back. 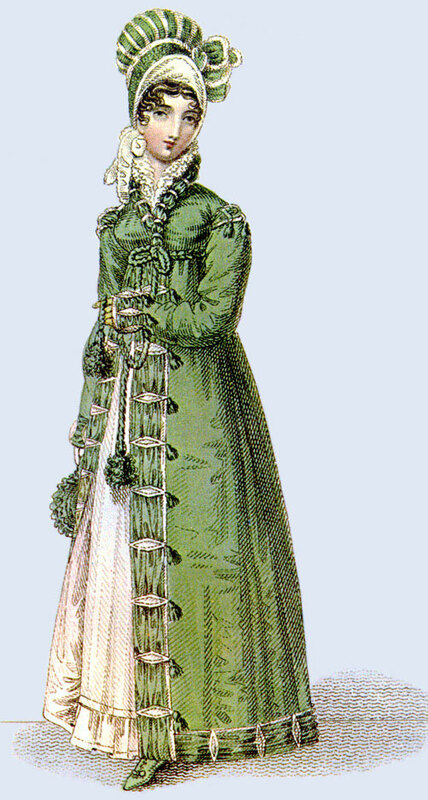 Here we have a pretty walking dress, consisting of a white muslin underdress and a green pelisse-robe that is lined in white. The underdress is thin, and most likely sheer, as the style of the time demanded. It has a short ruffle at the hem, which is topped by a narrow bias band. The high collar has several layers of ruffles and opens into a V-shape at the front. The pelisse-robe serves as a coat that may be worn indoors or outdoors. It has long sleeves that come down over the hand, with a shirred cuff that’s slashed and puffed. The collar is rolled, padded, and bound with white ribbon. Down the front edge of the pelisse is a band that is gathered horizontally every few inches; the shirring is hidden by white double diamond-shaped insets. This trim continues along the hem of the pelisse, with the shirring and diamonds turned vertically. Braided rope decorates the empire waist, secured by a large bow with long tasseled ends. The gathered sleeve caps have green tassels, much like military-style epaulettes. The pelisse is lined in white. The lady wears no jewelry, but has on pale yellow gloves and matching low-heeled green boots. Her hair is parted in the center, with curls at her temples. In her hand, she carries a round purse that is trimmed with ruffles. Her green bonnet is lined with white and has a large puff of green and white stripes. It ties to the side with a white ribbon. What do you think of this walking dress? Is it too matchy-matchy with all the green and white, or is it perfectly coordinated? This entry was posted in Friday's Fashion Plates and tagged Fashion Plates, Friday, Regency. Bookmark the permalink.